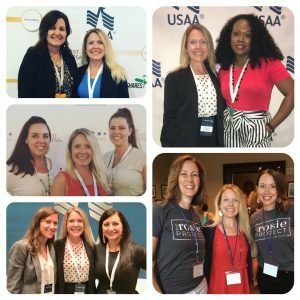 In 2017, I watched as a flood of pictures took over social media from the 1st annual Military Influencer Conference. It looked like everyone had such an amazing time. I knew that I didn’t want to be watching in pictures again this year and I wanted to be a part of it. So, I purchased my ticket 6 months in advance and began feverishly planning this exciting trip down to Orlando, Florida for my work-cation. You know how the saying goes, “When in Rome….” Well, when you are in Orlando, you have to at least stop by Disney, Universal Studios, or Sea World. Due to my child-like wonder and obsession with sea life, Sea World was my top choice. 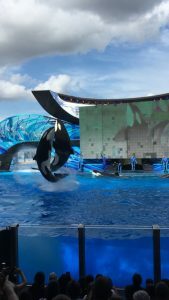 With the help of the Waves of Honor program, I received a voucher for free admission to enjoy a day at Sea World prior to the conference. 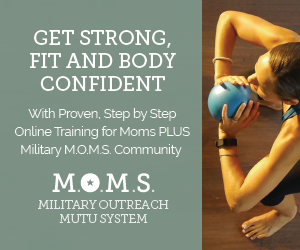 When I arrived at the conference, at Rosen Shingle Creek, it was like a reunion between all the military spouses I had met online and collaborated with all year long. Even though we had never met in person, it was such a beautiful thing to finally meet each and every one of them. It was as if we had known each other forever and it felt like I finally belonged somewhere in this ambitious group of entrepreneurs. I was with my tribe and we were still helping and cheering each other on as we had done all year long online. 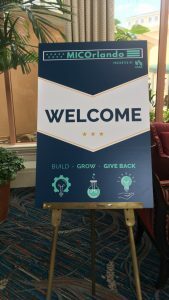 The Military Influencer Conference fostered a warm and inviting environment that inspired networking and the art of helping each other grow. It did not matter how large or small your business was or how many followers you had, everyone was treated with the utmost importance and respect at this conference. Curtez Riggs, the creator of MIC, made sure to highlight the importance of networking and helping each other, which was a large component of this conference. Rosen Shingle Creek catered two days of amazing three course lunches during the conference. My inner foodie loved the beautiful, delicious, and creative dishes we enjoyed as VIP ticket holders. 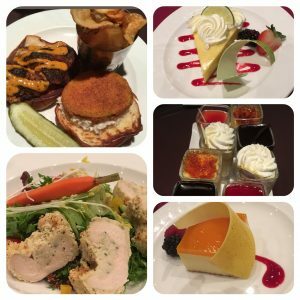 I was truly impressed with the food selection each day and most especially the desserts. 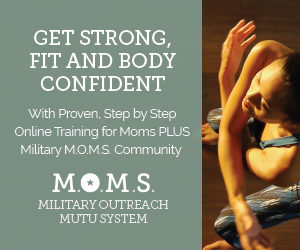 1-Janine Boldrin of Military Spouse Magazine explained the importance of storytelling. She discussed how “stories invoke a feeling and people will identify and buy products from a brand that has a good story.” As we know, not all stories have a happy ending, so she addressed how someone with a sad story can avoid being a Debbie Downer by “discussing what’s next in the story” or what they might have learned through that tough situation. This is important as some of the best stories are tragic, but can have such an inspirational message embedded into them. 2-Tony Perez, Marine Veteran, from GoDaddy stated that “There’s nothing worse than a leader who leads with his mouth and not his actions.” I am a firm believer in this statement as I believe actions are a tell all in the depth, loyalty, and leadership capabilities of any person. Whether you are leading a small business or a fortune 500 company, your actions matter much more than your words. 5-In the Influencer Marketplace, Jennifer Pilcher, Lindsey Goebel, and Lacey Sladky from Crosby Marketing Communications shared with us the importance of building your brand. These ladies did an excellent job providing handouts for note-taking, presenting valuable information, and allowing time for us all to further develop and refine our brand as well as the message we are relaying about our businesses. The phrase that stuck with me from this breakout session was “Everything you do projects who you are.” What they meant by this is that you have to constantly live your brand and build a consistent message for your brand. 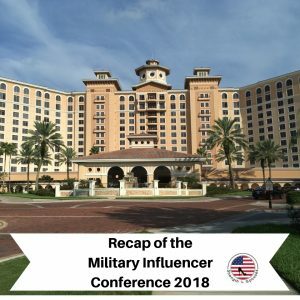 Attending the Military Influencer Conference was well worth the investment. 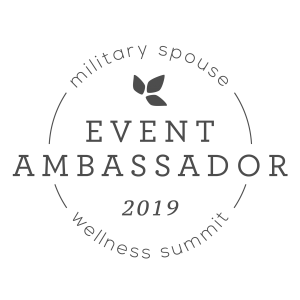 The connections made were priceless and spending a few days with some amazing milspouse friends, Veteran-owned businesses, and companies that support the military community were a few of the many highlights of the conference. We learned tremendously, ate amazing food, created new business partnerships, formed new collaborations, and made lasting memories. 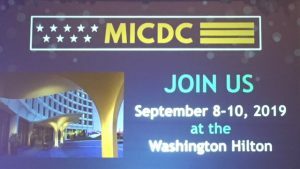 If you want to be a part of next year’s conference as an attendee or as a vendor, click here for more information. Thank you so much for this recap. I greatly appreciate hearing the details and am sincerely hoping to make it next year. It was so great meeting you in person and sharing some of these experiences with you. I can’t wait to see how you grow this year. See you in DC! I absolutely loved and enjoyed this post! Great recap of a fun few days!